Overcast and 45-ish, so pretty cold but not freezing; sleety rain during the first half, with sunshine during the second half. 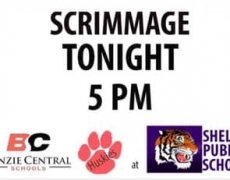 We left the school at 2:45pm (students were dismissed from classes at 2:15pm, because we thought our bus was leaving at 2:30pm) to travel to Shelby; soccer games are played at the field to the south of Shelby Middle School at 641 North State Street, Shelby, MI. For those who don’t know, that is past Manistee and Pentwater, not quite all the way to Muskegon. We arrived at about 4:30pm, warmed up a bit (we did not have a chance to go through our full warm-up), and the scrimmage began at 5pm. We played one 30-minute half, followed by a 45-minute half (since the sun came out, we agreed to play longer). 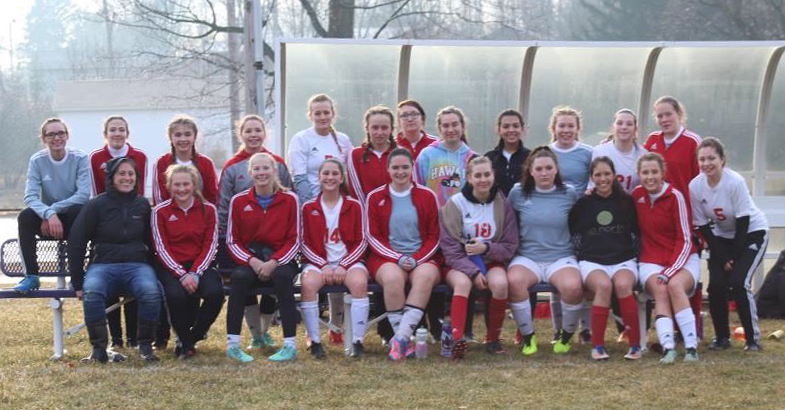 So if I were to talk generally about the scrimmages, I would say that the girls had tons of fun and you could tell that they were excited to be outside and playing “real” soccer after being cooped up in the gym for the past two weeks. We are still figuring out positioning, having gained several new players this season. We tried quite a few girls out at several different positions, which really helped the coaching staff to begin to figure out where the girls will be playing this season. For instance, Annalise Tallent, Ashley (Simerson) Whaley, Clara Reed, Emily Johnson, Lauren Serrano, Lea Baeverle, and Novia Dalzell all found themselves at Center Defense and/or Center Midfield at some point throughout the scrimmage; Allie Barker played sweeper for most of the scrimmage, but was relieved by Alana Kuhlen, who did a very nice job; outside defense positions were played by Alana Kuhlen, Annalise Tallent, Emily Johnson, Isabel Pataky, and Reeve Katt; outside midfield positions were Alice Dixon, Alyssa Reed, Emma Quick, Maelyn Beasley, Rachel Vanhoorne, Reeve Katt, and Trinity Dalzell; forward positions were played by AuSable Kreiner, Brook Lautner, Emma Quick, and Leia Schendell. Over the course of the next few games, we will be continue to play around with positions until we get our girls into the best fit, which is normal — all in all, I feel like we have quite a few girls who could play a variety of positions. Overall, our team played decently, given that this was the first showing of the year. Thanks to the Dalzell family for sending cheeze-its for a bus snack, along with the Tallent family sending granola bars and the Quicks sending cheese/cracker sandwiches. The girls devoured these on the bus, so fortunately, the Vanhoorne family brough cheese, crackers, grapes, meat slices, and carrots for halftime snack. (Unfortunately, Rachel Vanhoorne was injured during the first half of the game; she saw the Shelby trainer, who had her put ice on it and sit for the rest of the game.) On the way home, we stopped at Subway in Manistee, and we arrived back to the BCHS parking lot around 9pm. ***Note that we had not really practiced outside much before this scrimmage… So far, we have practiced inside the Middle School gym and hallway every school day since Monday, March 11, except for Tuesday, March 19, when we went outside for the last half hour to play “handball,” a European game that helps our soccer players with spacing. (I know, it seems counter-intuitive to have the girls using their hands, but it’s actually very good cross-training for soccer, and it was something that we could do — run around on the soccer field in boots, use our hands, and not have to worry about kicking on several inches of snow.) Also, on Friday, March 22, we only practiced inside for about 30 minutes, because we were working on the Benzie Athletic Hall of Fame fundraiser project. After two weeks of indoor practices, we then had spring break for a week. We have now had one practice outside on our field actually kicking balls around on Monday, April 1, the day before this scrimmage.